Natren probiotic supplements deliver results when others do not. It’s no wonder that hundreds of health professionals and retail health product stores, including thousands of customers worldwide, trust the Natren brand. Probiotic pioneer Natasha Trenev has been committed to formulating and manufacturing probiotic supplements of unparalleled quality for 35 years. Natren has willingly subjected itself to the most stringent international manufacturing quality control process, undergoing extensive testing from raw materials to finished probiotic products. The health of our customers is that important to us. 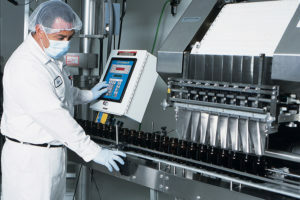 We manufacturer all of our probiotic products – we control the quality of our probiotic supplements from start to finish. We specialize only in probiotic products – we are 100% dedicated to probiotic development, it’s all we do! We make only clean probiotics – probiotics free of undisclosed ingredients that interfere with health, healing and recovery. Located in the United States, we own and operate a state-of-the-art manufacturing facility with every single Natren product made in small batches with quality ingredients that has not been purchased by a third party as most other companies do. We take our time with every process we engage in to ensure the viability our probiotic bacteria from our lab to you. 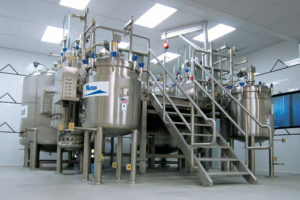 We control every step of manufacturing from research, development, fermentation, freeze drying, quality analysis, independent laboratory testing, bottling, proper storage, to temperature controlled transport. In fact, Natren is one of the only probiotic manufacturers that has attained international cGMP certification through Australia’s Therapeu8tic Goods Administration (TGA) at the pharmaceutical and medicinal food level. International Current Good Manufacturing Practices (cGMP) certification. The Australian Government’s Therapeutic Goods Agency (TGA) inspects us every two years. We’ve passed every year since they started in 2001. We’ve invested the time, energy and money to make our probiotic factory the finest in the world. We guarantee you get the cleanest, most potent and safest probiotics on the planet. Probiotics is all we do. It’s been our passion since Natasha and Yordan Trenev established Natren in 1982. The Trenev’s vision was to make available only the finest probiotics on the planet. They knew they couldn’t make world-class probiotics by being unfocused. That’s why Natren doesn’t make or market vitamins, minerals, fatty acids or herbs. It’s time consuming. You can’t rush the process. And, you’ve got to know you’re doing. Mistakes mean you’ll either produce crap or something dangerous. So how much time and expense do we invest? We had to find the best probiotic super strains in the world. We then we have to manufacture them. These powerful microorganisms are tricky to work with because they’re finicky and delicate. Using cheap strains here would’ve been easier. Why? Because generic probiotic strains survive “man handling” much better. Our super strains need careful handling at each of manufacturing, storage and transport. Otherwise they’ll grow and reproduce in the bottle instead of in your gut. Think of our probiotic super strains as motivated “mini-soldiers”. They need to stay sleeping until just the right time. Don’t wake them up to early! This why we specialize. It’s also why we’re known worldwide as the probiotic specialists. Why go to all the trouble of making the finest probiotics on the planet and then have them die in plastic bottles? We didn’t think plastic packaging made sense. We use glass bottles and metal lids. This protects the probiotic super strains from moisture, light and heat. These three factors that make bacteria grow super fast in the bottle. We wanted our probiotics reproducing fast in your gut–not in the bottle where they die off. We flush the inside of our bottles with nitrogen gas to push out all the oxygen before we put the lids on. And the nitrogen stays in the bottle because we use use glass bottles with metal lids. Nitrogen leaks out of plastic packaging. And, it even leaks out if you use glass bottles with plastic lids. We use a special sealing process to apply the outer safety seals on our bottles. 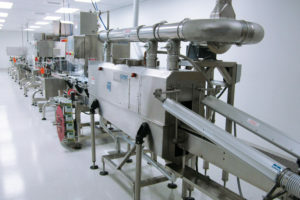 This special process uses lower temperatures. This means we reduce exposure of all our products to undue stress. Glass bottles with metal lids are more expensive to buy and add weight to shipments. But we think it’s worth it. We know that our packaging is vital to making our products safe and effective. Transporting probiotics puts a great deal of stress on the bacteria. Temperature variations, excessive movements and moisture can kill. So we ship all our products under temperature control. This means every Natren product stays under refrigerated conditions from our factory cooler to the fridge you buy from. 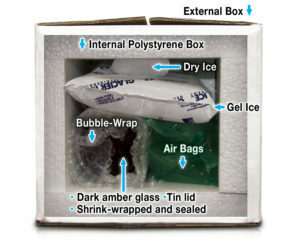 We use eco-friendly insulated boxes with ice packs to keep every probiotic cold. 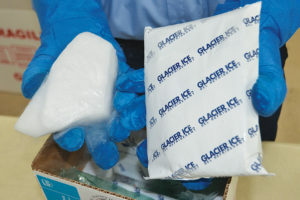 And we’ll even add dry ice during the hot months to keep the ice packs from melting. Now that’s factory fresh. In fact, we can get Natren products cold anywhere in the world within 48 hours. All Natren probiotics guarantee probiotic potency for each probiotic strain in the formula. We express this potency in colony forming units (cfu). We print this potency guarantee on every label of every product we make. Buy any Natren probiotic and you’ll know exactly how much of a probiotic strain you’re taking. Generic probiotics can’t guarantee this strain specific potency. What probiotic strain is in the bottle? 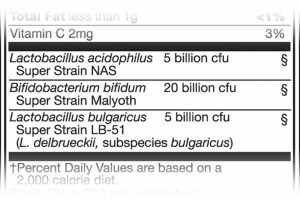 Exactly how much is there of that specific probiotic strain for each serving? Read any Natren label and you’ll see what super strain you’re taking and how much of it you get in each serving. We do this with our single super strain formulas and our triple super strain formulas. You can’t give a potency guarantee when you mix together probiotics from the same family. This means you don’t get a strain-specific potency guarantee mixed multi-strain probiotics. The problem comes about because all lactobacilli look the same under the microscope. And, all bifidobacteria look the same under the microscope. But you can easy tell the difference between a lactobacilli and a bifidobacterium. That’s why mixing probiotic strains up in a bottle doesn’t work. There’s no way to tell what you’re getting in the end. And how can you count what you can’t see? Every Natren product we make comes with a potency guarantee of 12 months. 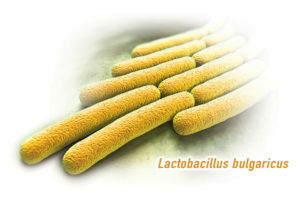 This means we guarantee that you’ll get at the live probiotic super strains listed on the label. Every Natren probiotic contains proven, tested super strains. Super strains are probiotics strains proven safe and effective by good science. This means they’re both safe and effective for long-term human consumption. To understand what this statement means, you’ll need to understand a little about the nature of bacteria and the difference between a bacterial species and a bacterial strain. Our probiotic super strains are very strong and very useful because they inhibit undesirable microorganisms in your intestinal tract by producing inhibiting substances like hydrogen peroxide and bacteriocins. It’s important to remember that not all probiotic strains are strong and useful like our probiotic super strains–many probiotic strains are weak and not useful and simply take up space in a capsule. For example, did you know that there exist over 200 different strains of Lactobacillus acidophilus–each with a different strengths, abilities and effects on our health? We’ve pushed microbes to evolve into more aggressive and resistant forms. This means we have more dangerous bacteria, viruses, parasites and fungi. These stronger and more resistant invisible invaders have made our world more dangerous. And we need stronger and more aggressive good microorganisms to protect–we need super strains. Natren super strains are “weaponized” probiotics. They’ll help you thrive in this more dangerous world of more aggressive microorganisms. Every human including you has a unique mix of microbes in and on our bodies. Scientists call this microbial mix the microbiota. Your microbiota consists of bacteria, viruses, fungi and protozoa. 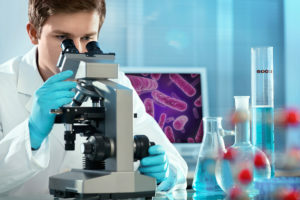 In fact, everyone’s microbiota is so unique that scientists say we each have a “microbial fingerprint”–and this microbial fingerprint can now be analyzed. So in effect, you have a unique fingerprint on your fingers and a unique microbial profile in your gut. Studies in humans and published in reputable and reviewed journals shows that Natren’s probiotic super strains create a healthy microbiota balance in your small and your large intestines. 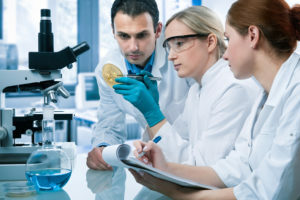 And, most importantly, we’re committed to research excellence and will continue to do clinical studies–even though they are time-consuming and expensive. Our in-house research and development team continues to build on the technological innovations Natren pioneered. They’re dedication to science, the truth and uncompromising commitment to quality guarantees that the products we develop for tomorrow will deliver the same fantastic results you enjoy in the products we have today. Keeps our probiotic super strains together with their original growth medium. Enhances survival through harsh stomach acid and bile acids. Allows more probiotic microorganisms to reach target intestinal areas. Contains probiotic-enhancing micronutrients to enhance probiotic potency. The supernatant contains microbial metabolic by-products which improve gut and whole body health. Probiotic bacteria produce these metabolites by reproducing in the original growth medium. The most advanced probiotic delivery technology in the world. The Trenev Process® microenrobes each super strain in its own oil matrix ecosystem. Keeps each super strain completely separated from one another. This means they don’t compete with each other and kill each other off. Protects delicate probiotic super strains from harsh stomach acid to reach the small intestine. 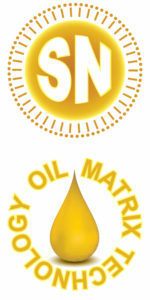 We remove all the water and oil from organic sunflower oil as the base for our oil matrix delivery system. Most don’t get along. They compete with each other for food and space. We call this antagonism. All Natren super strains are bile tolerant. We believe in clean probiotics free of undisclosed ingredients that interfere with health, healing and recovery. NO dairy (garbanzo bean base and rice-based products only): tested true dairy-free so Natren probiotics are ideal for vegans and those wanting to eliminate dairy from their diet. We believe clean probiotics are the best probiotics.